Last week I told you all about poetry snack time and promised to share some of our favorite books of poetry with you this week. Over the last year or so, we've sampled a fair number and variety of poems and poets. We've enjoyed almost all of them, but these are the ones we've read more than once, decided to purchase, or cuddled up with on a rainy Sunday afternoon. In other words, they've passed the test. I loved this one long before we started doing poetry snack time. In fact, I can't believe I haven't purchased it yet. I just keep checking it out from the library over and over again because with each approach of a new season, I crave these poems all over again. They capture the quiet beauty and lively vibrancy in our incredible world. I feel like every family needs to own at least one good poetry anthology for quick and easy access. For our family, it happens to be this one. That's not to say there aren't other anthologies we would love to have (The Bill Martin Jr. Big Book of Poetry and The Random House Book of Poetry for Children are two that come immediately to mind), but with this one's focus on animals, it's pretty much perfect for our family. It runs the gamut, everything from Robert Frost to Walt Whitman to Jack Prelutsky, and they're all accompanied by gorgeous (and I really do mean gorgeous) photographs. If you check out this book, you'll soon follow my example and buy one for your own library. I couldn't make up a list of favorite poetry collection and not include at least one by Shel Silverstein. I just couldn't. His poems have delighted and amused my children far too much to not be given their due (even if no one needs a reminder that he's out there). I was fortunate enough to find hardbacks of both Where the Sidewalk Ends and Falling Up at the thrift store, and it is not unusual to find Aaron perusing (and laughing) through one of them. His poems sometimes cross the line into the totally bizarre, but I think that's why we love them so much. They're always a surprise. Plus, his poem "Spaghetti, Spaghetti" was the first one my kids memorized, so he'll always have a nostalgic hold on my heart. If you can't get enough of Shel Silverstein, then you should definitely give Jack Prelutsky a try. His poems are similarly wacky, and we find ourselves reaching for them when we need a good laugh. He's also responsible for the poem, "I'm the Single Most Wonderful Person I Know," which was a timely reminder to Maxwell about the importance of humility. I didn't come to truly appreciate Ogden Nash until last summer when we checked out his collection of animal poems, and then I finally understood why Mike's siblings are so fond of quoting him. It's because he's so quotable! Most of these poems are quite short (three to seven lines), and my kids only had to hear them two or three times before they were reciting them back verbatim. The humor in them is at once simplistic and sophisticated, which means that both my kids and Mike and I can all read them with equal enjoyment. We especially love "The Panther," "The Shark," and "The Termite." This one gets creativity points for sure. Each poem is a retelling of a classic fairy tale: first, from one point of view, and then, the word order is reversed to share a different point of view. So we've got Hansel/Gretel and the witch, Little Red Riding Hood and the wolf, etc. The poems are accessible enough that even if your kids are too young to understand the structure, they will still enjoy the poems. But if they can grasp the total genius of what's going on, well then, their minds will be blown, and you won't be able to stop them from poring over the side-by-side verses, comparing them, and realizing how just a simple change in the word order can drastically change the telling of the story. This one is our most recent find, and, oh my goodness, it was love at first sight for me. It is a short collection, just twelve poems, one for each month, but it conjured up happy memories and feelings from my past that no poem has ever managed before. For example, this, from "June": "The live-long light / Is like a dream, / And freckles come / Like flies to cream." My heart just yearns for summer! (And those illustrations by Trina Schart Hyman aren't too shabby either.) After we read this collection during poetry snack time, I told my kids that we're going to memorize one poem each month. The one for March is up on our kitchen wall right now. This list would not be complete without this collection on it. Most of the ones I've mentioned so far are ones I've discovered and grown to love with my own kids. But not this one. No, this one is from my childhood. I can still remember pumping my legs hard on our swing in the backyard and hearing my dad recite, "How do you like to go up in a swing? / Up in the air so blue?" These poems are the essence of childhood. I'm glad they're irrevocably connected to mine and that now they'll be connected to my children's as well. What are your some of your favorite poetry books? Poetry snack time is coming up again soon, and we'd love to try out some new collections! Also, P.S., Episode 4 of The Book Blab will be airing on Friday, March 11th, at 9:30am MST. Suzanne and I will be chatting about 2016 releases. Come watch the live video feed right here on the blog! Oh the Child's Garden of Verses is a total favourite here, has withstood the test of time, of years! The others are unfamiliar to me, I'll have to see what our library has. You'll have to let me know which ones your library has! I'm always curious which books overlap between Australia and the U.S.! I love the National Geographic Book of Animal Poetry! I waaaaant it. You're making me realize I really need to expand our poetry collection. We don't have any silverstien or prelutsky at the house! egads! I will tell you my current favorite poetry source though: grandma bought each of the kids a subscription to one of the cricket family of magazines (Spider, Ladybug, and Babybug are the ones we get). They're full of great poetry, fresh every month, oh, I just love it. Oooh, good recommendation! I just saw your post about this, too! My six-year-old just got a subscription to Ranger Rick for his birthday. I think he's going to love a monthly surprise in the mail! Definitely let me know how Ranger Rick is, and whether he likes it! Our library has most of these! Woohoo! Thanks for the great suggestions. I still have a few Child's Garden of Verses memorized. What a great list! We love a lot of these as well -- and I'm definitely putting "Mirror, Mirror" on hold at the library! I'm going through the National Geographic Book of Nature Poetry with my son right now. Absolutely gorgeous photography. I'd love for you to share this post at Literacy Musings Mondays, if you're interested! You can find it at http://pagesandmargins.wordpress.com/2016/03/13/literacy-musings-mondays/. Hope to see you there! That's so great, Beth! I need to check out that one! And yes, I'm happy to add my post to the linkup! You're welcome! Even if she's not old enough to read yet, any of these would be great to read aloud to her! Great list! 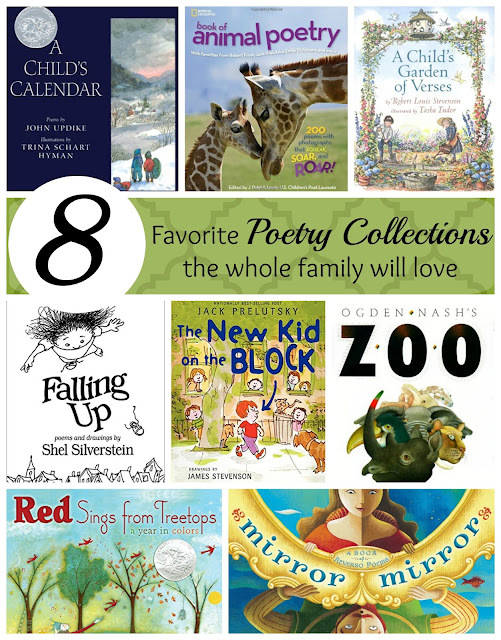 So many of our favorites and many new ones for us to check out too, just in time for Poetry month. Oh good! Let me know what you think of the new ones! Great round up of poetry books. I have an entire shelf of children's poetry, so hard to choose but here's a link to the favorites I shared during Poetry Month 2016.